At the very core, the job of an audio interface is to enhance the sound output of a computer. They are a lot like sound cards but offer a considerably better performance than sound cards. Most computer sound cards or outputs are not meant for high-resolution output. Therefore, they are insufficient when it comes to music production. Moreover, an audio interface works in preparing sound that you put into your computer. An interface makes sure that the user is able to record quality, high-resolution sound. However, before getting a basic understanding of how an audio interface works, we must understand what an audio interface is. An audio interface is a hardware that is used for connecting audio gear, such as microphones to computers. The device works by converting analog signals into digital audio. This makes your audio computer readable, and the computer is able to process it like any other information. The audio interface sends digital audio to a computer through a medium. This medium connection can be anything from a special PCI/PCIe card, USB to FireWire or Thunderbolt. The device can perform the same job in reverse as well. It receives digital information and converts it to analog signals. These analog signals can then be heard through headphones, speakers or studio monitors. It’s common for audio interfaces to have line-level analog inputs or outputs. They can also include one or more preamplifiers for microphones and even digital inputs/outputs like AES.S/PDIF or Lightpipe. When Do You Need an Audio Interface? There are many advantages of using a dedicated audio interface instead of built-in sound-cards. As discussed before, both sound cards and audio interfaces are not very different. At its base, the sound card is also an audio interface. However, sound cards have limited capabilities and aren’t ideal when someone wants to record audio. Sounds cards are meant for general use. This means that they only have consumer-grade stereo line-level input /output. Moreover, factors like electromagnetic and radio interference, excessive latency and jitters degrade sound quality. Keep in mind; it’s impossible to record a full drum kit with just two channels for input. Sound cards are ideal if you have less-demanding needs for audio. So, playing back compressed audio or connecting a couple of Hi-Fi speakers is fine. However, you’ll need an audio interface if you want to record or monitor production quality audio. There are a few considerations that are as important as choosing a suitable I/O configuration for your audio interface. You have to consider what you will need to record now or in the future while deciding on the number and types of inputs/outputs. There’s a lot of variety in the type of audio interfaces you can choose from. You can choose everything from a 2-channel desktop unit to a system that records hundreds of channels. For singers or songwriters, a pair of units is sufficient as long they choose the right ones. The majority of interfaces have two or more microphone preamplifiers. While using a condenser microphone, it essential to equip your interface’s preamp with phantom power. However, if you plan to plug your guitar straight into the audio interface, make sure that your interface has instrument level or “hi-Z” inputs. You shouldn’t forget that line-level inputs are ideal for headphone amps, outboard processors and studio monitors. People tend to disregard the importance of digital I/O when they’re starting out. But, they can prove to be useful later-on. For example, few high-end one or two-channel microphone preamps are equipped with digital outputs. This enables users to connect those preamps with their audio interfaces without removing line-level inputs. As the ancient saying goes, “The only thing constant in this life is change,” the technology in the recording industry goes through constant change as well. 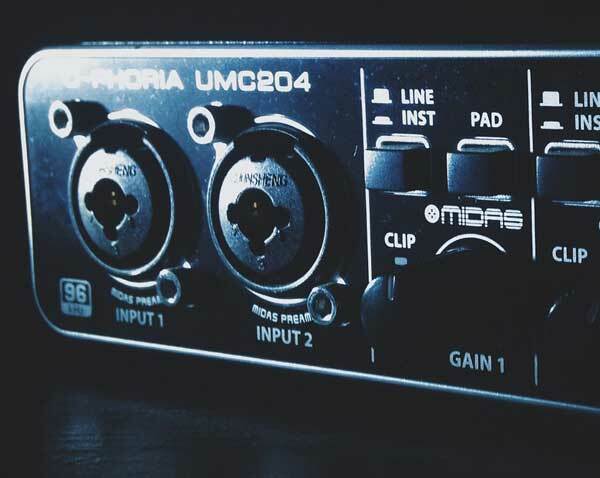 However, there are a few audio interface connection types that are still considered as standard. Some of these are FireWire, USB, Thunderbolt, and PCIe. Most computers (both PCs and Macs) have to cater to USB ports with version 2 or 3. FireWire (400 or 800) is still more common in Mac. The average speed of both these packages is 480 Mbps. Under ideal conditions, you can record up to 64 tracks through this speed. Yet there are simple interfaces that still support USB 1.1. This can be quite slow, but you can record one or two channels. Bit depth and sample rates are important specifications for any audio interface. Bit depth has a significant impact on sound when you’re processing audio. This means that CD-standard 16-bit audio has a total range of up to 96dB. Problems arise when the digital noise floor is high, and the remaining range is small. When working at 16-bits, the quieter section of your audio will have sudden noise. Professionals recommend working with 24-bit at a dynamic range of 144dB. On the other hand, the choice of sampling rates can vary according to what you intend to do with your audio. If someone is planning to release demos on CD or wants to post MP3s, it’s ideal to work at or mix down to 16-bit/44.1 kHz. For professionals who wish to release jazz in high-resolution, it would be disastrous to work at less than 24-bit/96 kHz. Sampling rates as high as192 kHz are useful for sound design. You can try the old trick of recording a dog snarl at 192 kHz and mixing it with a session of 96 kHz (without losing any resolution). This will result in giving you the traditional monstrous growl you have heard in most sci-fi movies. Eager professionals should remember some other considerations as well. There are still a few audio interfaces that are only compatible with either PC or Mac. Before buying one for yourself, see if the audio interface will work in sync with your machine or not. Many interfaces include handy features like embedded software control and DSP for mixing. Software mixing allows professionals to do special tricks with their interfaces. They can do everything from adding reverbs, setting up headphones mixes or delaying headphone mixes. You can also do talkback communication with artists in the studio. Moreover, you can do all this on an onboard DSP without increasing latency, affecting DW software or draining your CPU power.